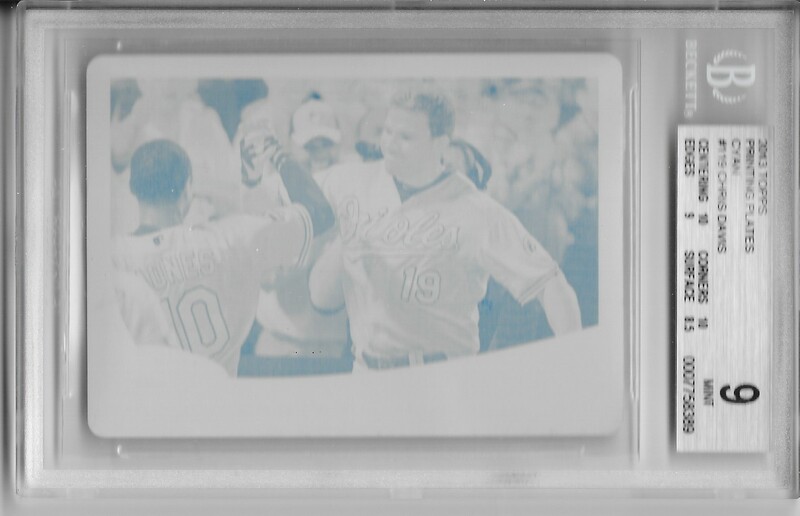 I picked up a bit of a steal (I'll come back to that in a minute) on Ebay when I got this really cool 2013 Topps Chris Davis graded printing plate. The plate is the cyan version (I already had one of the other plates, but I forget the color). It has been graded by BGS, as you can see, and has a 9 grade. This, from what I've been told, it a really good grade for a plate. This card was on my watch list on Ebay for a while, but no on picked it up. Finally, the price dropped, and I snatched it up. Total shipped, I spent $6.79 on this plate. Not bad, right? I feel like I did pretty well on it, considering raw plates of Davis go around $40 or $50. I don't know how I got this steal (well, maybe I do, it was a bid auction, not a Buy It Now), but I am really happy that I did. I picked up a really cool piece for my collection recently when I purchased this trophy ball from a guy off of Instagram. In case anyone is wondering, I will explain what a trophy ball is. 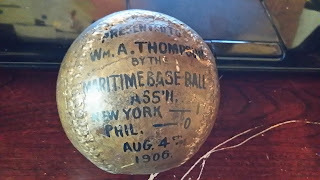 In the early days of baseball, especially at the amateur level, only one ball would be used per game. At the end of the game, the winning team would decorate the ball, put the score, date, etc., and would present it to someone. I spent some time this morning trying to find information on the ball, but so far, I have come up short. 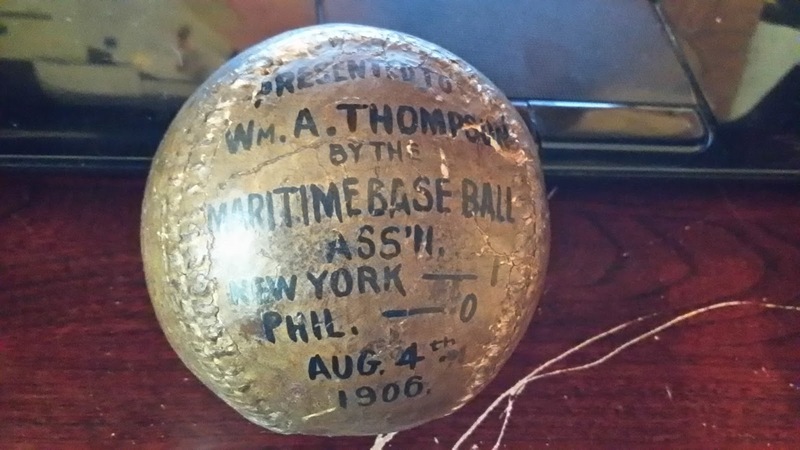 I'll continue to research it, as time allows, because I would really like to be able to find some information on this ball, and the game it describes, if it is available. Regardless, the ball is really cool. I'm glad I was able to get it. The Instagram Card Community is a great place for trading baseball cards and memorabilia, but the average age of the users appears to be about 15 or so. I am one of the oldest people who are trading actively on there. One of the other folks who are about my age is Fred, who is also from NC. He told me recently that he was preparing a care package for me, just because, and told me that I would really enjoy it. 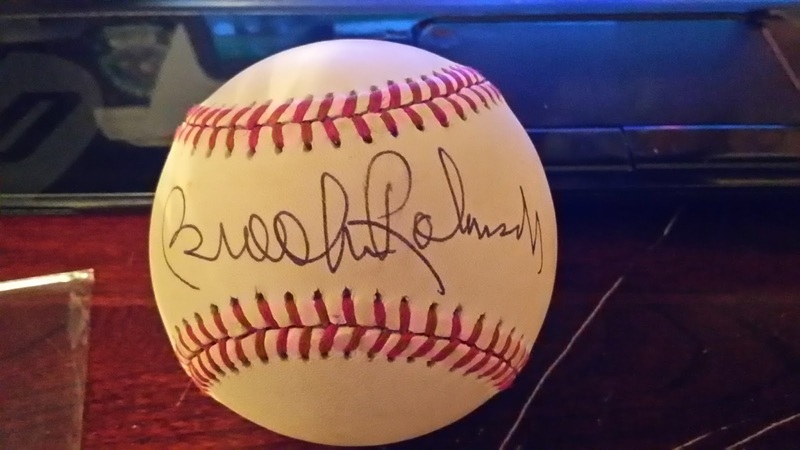 I was very surprised to find this Brooks Robinson signed OMLB. According to Fred, he had this ball for a LONG time and decided that when he parted with it, it should go to someone who would love it. Again, Fred was right. I really love this baseball. I now have three of them: this one, one my mom gave me and one that I got TTM. This one might have the cleanest signature of all. Fred also included this really nice Christian Walker Bowman Inception auto. I like the design on these cards and the signature on this one is really great. I just can't get over how amazing this care package was. Fred is a great guy, and I'm happy that the NC and Instagram Card Communities have such a strong bond! I made a purchase for myself off of Ebay recently for my Davis PC. I hadn't really bought much for myself, so when I saw this, I jumped all over it, mainly because I wasn't sure if I would see another. 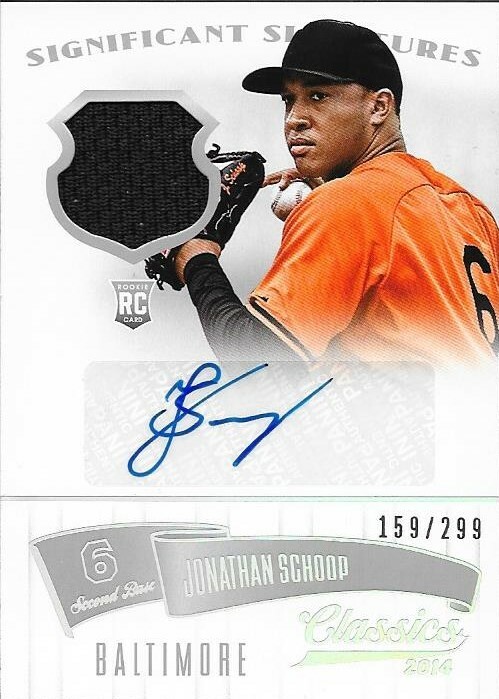 This is a 2015 Topps Mini black parallel that is numbered 6/10. The Minis were an online exclusive from Topps, and were only sold as complete sets. I guess each set came with a few random inserts, so I imagine getting these will be pretty tough, since I'm sure not a lot of people will be busting their sets. The card looks really cool. 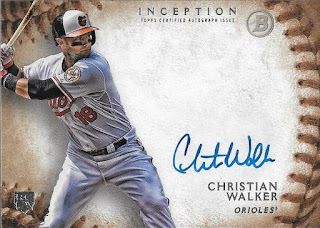 It isn't foil like the larger 2015 Topps inserts have been this year, but it still looks nice. I got it for a great deal, as well, at only $5. I have been active in the Instagram trading community for about 2 years now. During that time, I have met quite a few collectors that I would go so far as to call them friends. I have also met some folks who don't necessarily collect, but I chat with them often about baseball, collecting, life and whatever. For a while, I have been chatting with a kid named Dalton, from Minnesota. He's into geology, so we talk about fossils and shark teeth and stuff, but had never done any trading. Recently, he surprised me with a care package, saying that he was getting rid of some baseball cards so he could concentrate on football. He also wanted to send something nice for my son, Chris, since his birthday was around that time. I was surprised when I opened the care package that Dalton sent. There were quite a few lower end relic and auto cards. I was expecting a few Orioles and Giants base, but the package having all of those relics and autos was really cool. There were some base cards as well, like the above 1972 Topps Frank Robinson. I think I actually need this one for the set, if I can ever get it started. It has a small crease on the left side of the card, but it isn't imposing, so I'll probably keep it in the set. If not, it will go into the Frank Robinson PC. I didn't scan each and every card Dalton sent, because he sent so much. Probably the highlight of the autos and relics was this game used baseball card. If you look closely, you can see that some of the stitches made their way into the relic. I haven't seen many relic cards like this, so it was one that I really enjoyed. This Tim Hudson relic was another card that Dalton sent that I really liked. It is just a nice, clean card. The card is numbered 245/250. Thank you so much for the care package, Dalton! I really enjoyed it, and Chris has, too! I completed a trade recently with my friend, Dylan from Virginia when I sent him a Rafael Devers auto that I pulled from a pack of 2015 Contenders baseball. 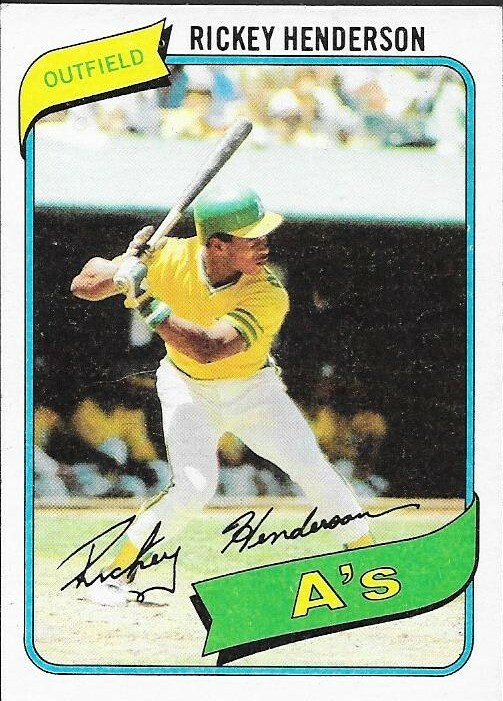 In return, he hooked me up with this really nice Rickey rookie. I had an extra one of these before, but traded it away. This one is in much better shape, even though it didn't scan all that great. 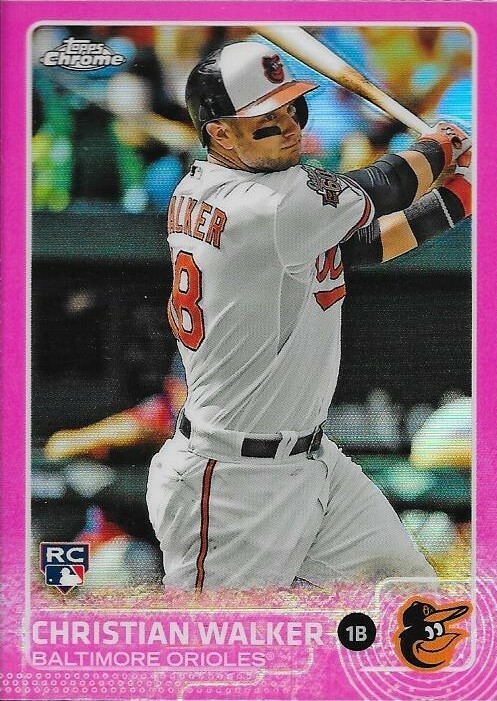 Dylan sweetend the deal with this 2015 Topps Chrome Christian Walker pink refractor. This is a nice card to see in person. I found it a bit odd that it wasn't serial numbered. I thought for sure that the pink parallels were numbered. Oh well. It is still a nice card. 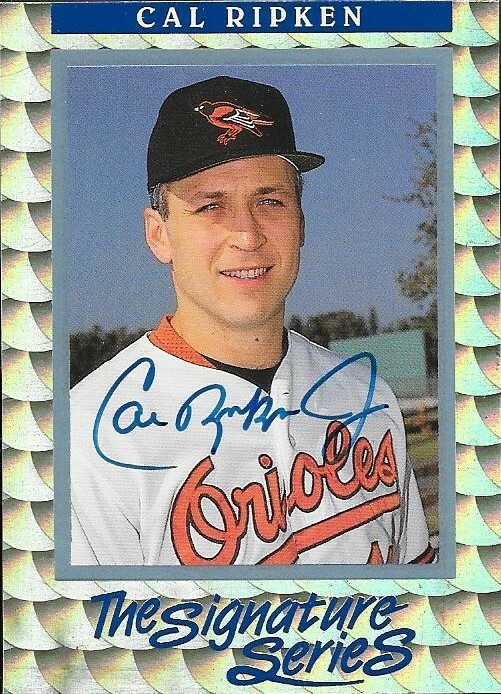 Finally, Dylan surprised me with this Cal Ripken standups card from 1985 Donruss-Leaf. It is an '85 All Stars standup, and as you can see, it features Cal inside the Hubert H, Humphrey Metrodome. I don't think I had this in my collection until now. I think I would know, especially since this is an elongated card, and it would stand out. Thanks so much for the trade, Dylan! It all comes down to this. I have ranked the cards that I consider the tops in my collection. I feel like I chose all of the cards on this list very well, and they all slot into their different positions nicely. The card that made No. 1 on the list has much more meaning to me than for it to be just another card in my collection. It meets a lot of the criteria that landed other cards on the list. Vintage? Check. Rookie? Check. PC Player? Check. The thing that pushes this card to the top of my list, ahead of all others is that it was/is the culmination of a PC that I never expected to start in the first place. 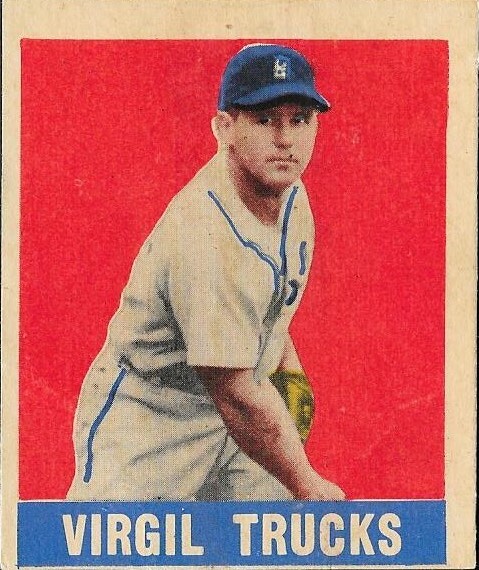 My 1948-49 Leaf Virgil Trucks rookie card. Anyone familiar with this blog knows how I feel about Mr. Trucks. He was a gem of a man, and a favorite to those in the hobby. I first discovered him when I was discussing TTMs with my good friend, Drew. I did a phone interview with him. I corresponded with him a great deal, and I cried when he passed away. He was a good man, and a great American. A hero to many of us in the hobby. When I bought this card, it was (and still is) the most that I ever spent on one baseball card. I won an auction on Ebay and got this card for $350.00. 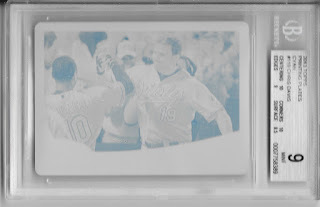 Graded, this one would likely go for a lot more. The price was so high, mainly because this card was a short print. It was the last of Mr. Trucks regular series cards that I needed for the PC. I added some more later on, like the 2011 Topps Black Diamond auto, but this one was the last of his regular issue cards from his playing days. It caps my Trucks PC nicely. Furthermore, this, like a lot of the older cards with minimal color, it really pops. The picture of Trucks on the card is a blurry, but he still looks cool. I also love the old school Tigers jersey. This card made No. 1 on my list for a lot of reasons. To me, it most represents what Mr. Trucks meant to me as a person and my desire to have a nice PC built around him. Thank you all for checking in to see my Top Ten posts; for all of the comments here on my blog, or my Facebook or Instagram. This has been a lot of fun to do. I plan on revisiting this in a few years to see if the numbers still stack up. Who knows, I may add some awesome pieces between now and then, and the list will get a good shake-up. For those that are interested, I created a page among my tabs (at the top of the blog) so you can go back and look at the Top Ten. I always hated the Top Watever countdowns that VH1 would have, because there was always some current song or artist that just didn't quite fit in with whatever the countdown was. Like, they would always try to find a way to sneak Celine Dion into the countdown. Like, Slash would be the Number 3 guitarist on their list, followed by Celine Dion at number two. Stuff like that. I tried my best to make sure that the list was comprehensive of my entire collection, and it didn't reflect any bias toward anything that was obtained last week versus last year. Thanks for reading! My 1992 Donruss Elite Cal Ripken auto card was one that I wanted to add since it was announced to be able to be pulled out of 1992 Donruss packs. 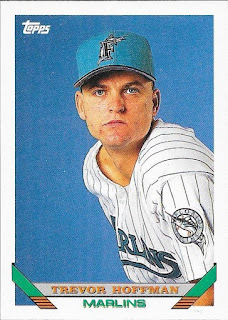 I can't even begin to count how many 1992 Donruss packs that I opened in hopes of adding this card to my collection. I had a chance to get one at the 2012 National, but declined, believing that I would be able to find one cheaper than what I found there. I made it my mission to get this card at the 2015 National and I was able to leave Chicago with it in my hands. I dropped $300 on the card, but in the end, I was super satisfied with it. I had walked clear across the Donald Stephens Center looking for it, until I found a vendor who had it. My excitement probably cost me a few bucks, since he wasn't willing to come down on the price any. It didn't matter. I wanted the card so bad, I was willing to pay up. The hunt for the card was a welcome side-quest at the National and made it a very enjoyable time. The auto is on-card and is still share after all these years. It is also the only signed card in my Top Ten. I guess it shows how much I value vintage and rookie cards. Still, Cal was my first PC and my first baseball hero. 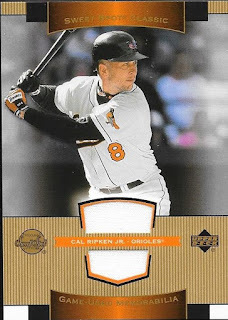 I doubt I will be able to add any Ripken card that means more to me than this one. As amazing as it would be to pull this out of a pack, I was happy with being able to find it when I could afford it, and bring it home. I've covered rookie cards, amazing vintage and set building in the previous Top Ten posts. There was no card I was more excited to receive that the next one on the list. 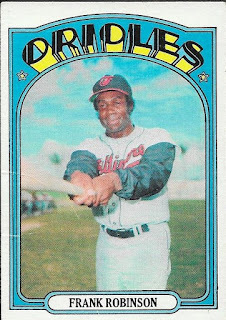 I was working really hard on building a major vintage set at that time, but I had told myself that I wouldn't ever be able to afford the key rookie card, so my set would likely be incomplete. 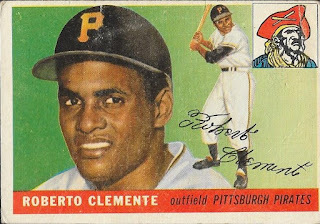 My 1955 Topps Roberto Clemente rookie card. I placed the bid on the computer at the card shop, but the auction was ending about 30 minutes after closing time. I raced to my parents' house and begged my mom to let me use her computer so I could watch the end of the auction (since I was still winning). She let me, but said "If your dad comes in, he's going to want to get on the computer and you'll have to get off." I took my chances and signed into Ebay. With about a minute to go, my dad walked in, wondering why I was on his computer. I told him I was winning an auction and really wanted to make sure I won. He walked over and saw it was for a baseball card; then he saw the price. I figured he would tell me how silly it was that I was bidding so high for a piece of cardboard. What he said next really surprised me, though. He chuckled and said "I guess we all have our things, don't we? You should see what I paid for the engine I just bought..."
He walked away, saying he would be back in about five minutes, to which I told him that would be fine. I ended up winning the auction for this card for about $150. That was a complete steal, since the book value on the card is exponentially higher. It isn't mint, but it looks great. 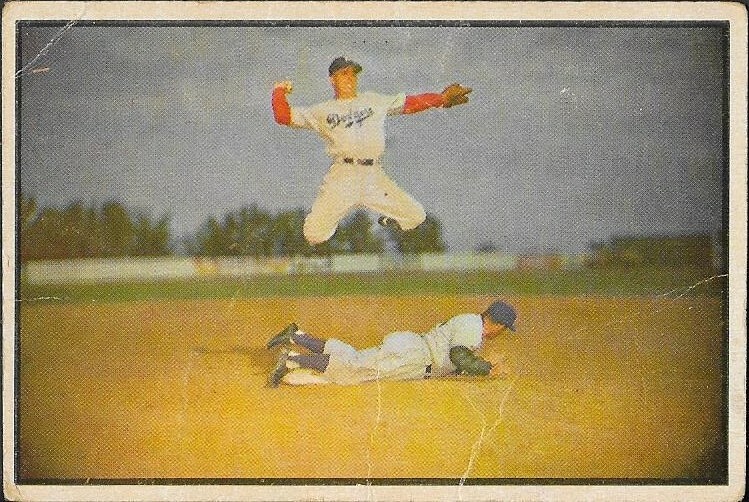 The card now resided with my 1955 Topps set, which I was able to finish about a year and a half later. I still think it is really cool that my dad got to see me get it, and he understood the importance of my collection to me. I'll always remember that about this card. I have met a lot of collectors over the years who's parents either didn't understand or support their hobbies. I am lucky to say that both of my parents not only understand, but they support it and they each have their own hobbies as well (Dad actually collects a great number of things, from fishing reels to trains to Johnny West figures and more). This card reminds me just how lucky I am. 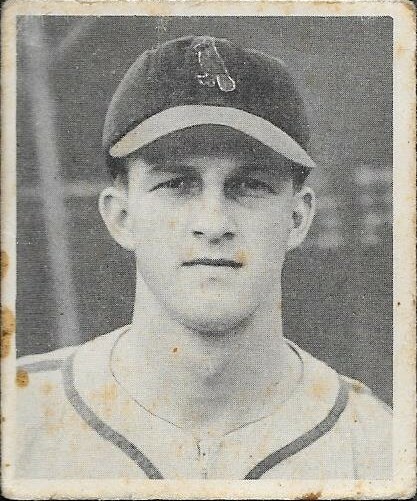 My 1948 Bowman Stan Musial rookie card is ranked No. 4 on my Top Ten because it really is a cool card. I saw one for a good price, and pretty much robbed it from Ebay at a time when Musial wasn't really at the forefront of people's minds. He is one of the all-time greats in baseball, but when the discussions are being had, he tends to be overshadowed by the likes of Mays, Mantle, Ted Williams, etc. Something else that is significant about this card is that this card pretty much showed me that I could complete the 1948 set, since it was one of the biggest keys to the set, and I was able to add it without having to take out a mortgage. I had already owned the Feller and Spahn rookies, so when I was able to add this as well, it was on! I was able to complete the set, and I added a couple other significant HOF rookies that were in there, but the Musial still ranks above and beyond those others. I really love this card, and I still am excited that it made its way into my collection. I'm sure that if this card is ranked at No. 4, then the three ahead of it must be amazing, right? We are halfway through my Top Ten list, and I have shown some pretty amazing cards, so far. There have been some great rookie cards, a sick patch and some really sweet vintage. Each one of the cards on the list is something that is pretty amazing. Card No. 5 isn't any different. This is a 2014 Panini National Treasures Chris Davis relic numbered 1/2. 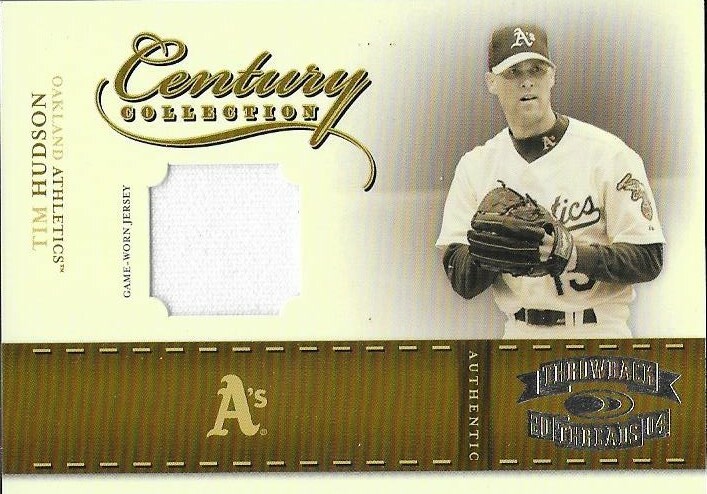 The relic is really cool because it is part of the laundry tag from Davis's game used uniform. 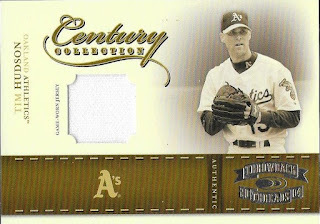 I have another card that is in my Davis PC that has a piece of laundry tag, but it is numbered much higher than this one. I also apparently know where the 2/2 is, but as of today, he still isn't willing to part with it. I got this card off of Ebay, but I don't remember what I paid. That's probably a good thing, I do know that I considered this a huge steal. I feel like I paid only around $50 for this. Maybe a little more, but not much more. I have spent a lot of time on my Davis PC this year, and I have some really great cards to show for it. It is only fitting that one of them was able to make it into the top five of this list. You don't often hear baseball cards referred to as works of art. However, before 1957, most baseball cards looked more like painted images rather than actual photographs. Cards like ones from the 1953 Topps set are a prime example, and they remain some of the most aesthetically pleasing of all-time. When fashioning my Top Ten list, one of the first cards I thought of is one I have had for several years and it remains one of my favorite cards to look at, and show off. Card No. 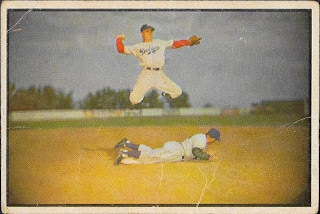 6 is my 1953 Bowman Color Pee Wee Reese. As you can see, the card is far from mint. There are surface creases in the top left and bottom right of the card. However, it still catches the eye right off the bat. It is a "Turn Two" card, and probably one of the best of all-time. I picked this card up back in 2009 or 2010, back when I was close friends with someone who was a huge Dodgers fan. I was looking for a nice vintage card to get him and I discovered this one. I liked the card so much, I wanted one, too! I was able to find one for $50 and another for $55, so I ended up buying both. This card has, like I said above, been one of my favorite cards in my collection since then, and it doesn't take much to wonder why. Upon further review after I purchased the two cards, I found that I got major steals both times. It is very difficult to find any versions of this for under $100, let alone two of them. This card, while it represents one of the better-looking cards in my collection, it also is a prime example of the luck I have had in "sniping" cards off of EBay. What is a top ten list without some amazing relic or patch? I have grown to love the pieces of uniform patches that sometimes make their way onto relics, and when it is of a highly touted prospect in your favorite team's system, that makes it even better. 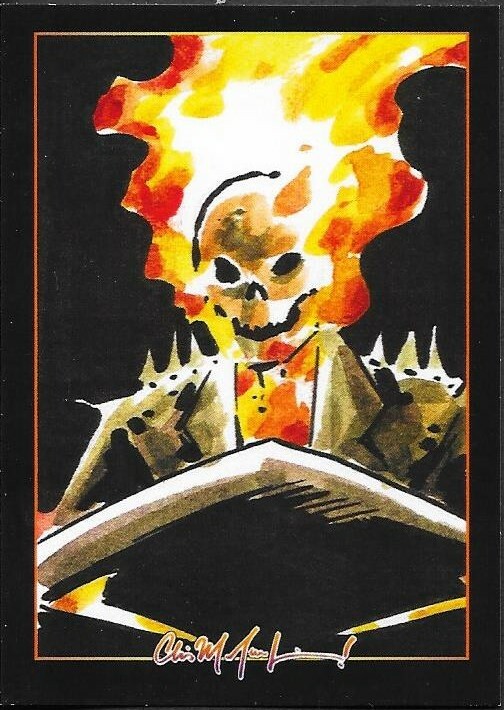 Add into the fact that it came from one of my favorite people in the hobby and is a huge piece in my history of trading on Instagram, and you have the reasons why this next card cracked my Top Ten. 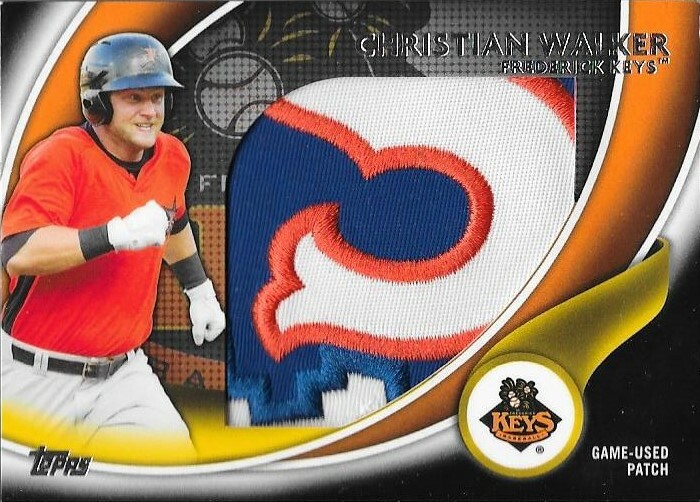 This 2014 Topps Pro Debut Christian Walker patch made it to No. 7 on my list and was part of a huge trade I made with my amazing friend, Max. The card is numbered 2/5 and is the "sickest" patch card that I own. I hate using the term "sick" when discussing a card, but I think it fits in this case. This card is awesome. The patch is actually game used and not a manufactured patch at all. I can't even put a value on it, because it means so much more to me than money. My friend made sure he made it very easy on me to get it, and it is now a jewel in my collection. Like I said yesterday, a common theme of my Top Ten cards is the Hall of Fame rookie card. It wouldn't be a true Top Ten of my cards if it didn't include some players who I PC that are near and dear to my heart. Another common theme is "vintage". I am a huge fan of vintage cards, especially Topps. Also, many of my favorite cards are ones that I "invested" a significant amount of money in, at least significant in my eyes. This next card is the fisr huge card purchase I had when I jumped back into collecting as an adult. 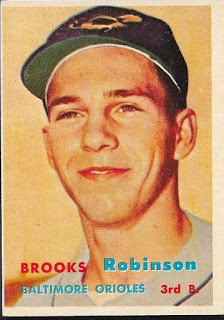 Card number 8 on my Top Ten list is the 1957 Topps Brooks Robinson rookie card. 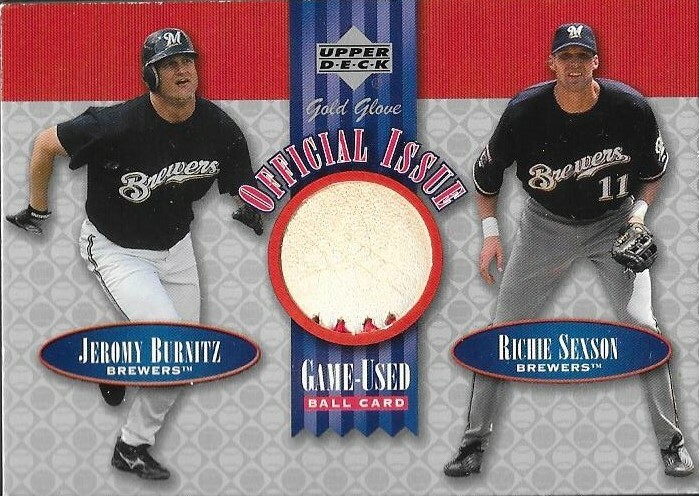 This card was one that, at the time, I had felt that I would never get a chance to own. I was used to operating on a very low budget, and being satisfied with pulling good cards from packs. After I got back into the hobby in 2005, I set my sights on a Brooks rookie that I could afford, and after a little bit of time, I landed this one in an Ebay auction for around $150.00. 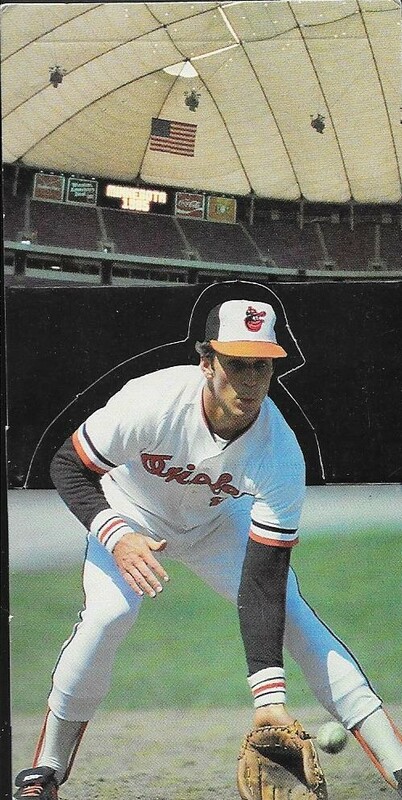 That was, at that time, the most I had ever spent on a baseball card. As you will see, I have since surpassed that with some of the other cards on this list. What can I say about Brooks that I haven't already said on this blog? I have met him a couple times now and he is just a gem of a fellow. Always the class act, I am proud to be able to say that I am a super collector of Brooks. Adding this card to my PC was, at the time, such a huge addition as far as PC cards goes. It still remains one of my favorite all-time cards. I have had the opportunity to add other '57 Topps Brooks Robinson rookies to my collection, at prices cheaper than what I paid, but I never jumped on them for whatever reason. I imagine that I will add some more of this card to my collection, because I like it so much. It is just a cool-looking card. This is a 1933 Goudey Jimmie Foxx that I got in a deal on Instagram a while back. 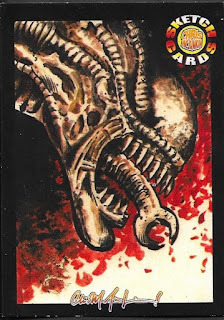 The card is graded by SGC and is "Poor". You can see that based on the severely rounded corners and the huge crease in the top right corner. 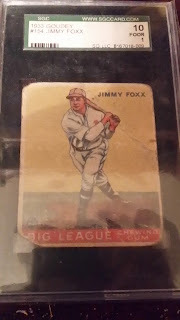 All grading issues aside, this is a Jimmie Foxx rookie card. Let that sink in a bit. Foxx is one of my PCs and one of my all-time favorite Hall of Famers. The deal itself worried me some, since it seemed so too good to be true. I got the card for $40 from a guy on Instagram that I hadn't dealt with before. It turned out that I shouldn't have prejudged so easily, because he was 100% legit and sent the card really fast. I haven't done any deals with him since then, but this had to have been one of my best deals on there. 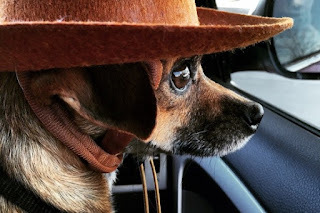 Lately, I haven't had a lot to blog about, so I got to thinking. Then, I thought some more. Then, I went to the bank and pulled my baseball cards out of my safety deposit box and went through my collection to try to determine my Top Ten baseball cards. It wasn't easy, but I think I got a pretty good list together. My intention is to blog each of the Top Ten, even though all of them have been featured on this blog in the past. Each card got a new scan, especially since some of them came before I got my new scanner, and way before I learned how to properly crop them as well. Card No. 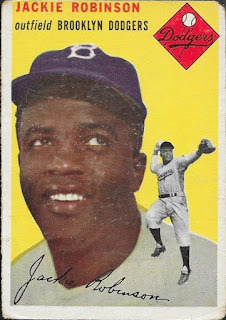 10 in my Top Ten (as of November 14, 2015) is this 1954 Topps Jackie Robinson. This card beat out a good many "honorable mentions" like my 1960 Topps Mickey Mantle, my 1953 Topps Satchel Paige, my graded 1967 Topps Brooks Robinson and countless others. I got this card back in May when I visited the Columbia antique shop with my mom. She picked this up for me, along with the '60 Mantle to cover for a couple birthday gifts and Christmas presents. I couldn't choose between the Mantle and Robinson, so she was awesome enough to get both. Thanks Mom! I only have two Jackie Robinson cards in my collection, this one, and the 1955 in my set. I intend to do the 1954 set at some point, but I still need a bunch of the higher end cards like the Aaron and Kaline rookies. The card itself is in pretty good shape, and is very aesthetically pleasing. I always enjoy the 50s sets like this one, and 1959, with their bold colors. I always find that they scan well. Jackie helps to make this list not only because he is a Hall of Famer, but also because he is a cultural icon. Having broken the color barrier and being a huge factor in the Civil Rights movement makes this a huge piece in my collection. 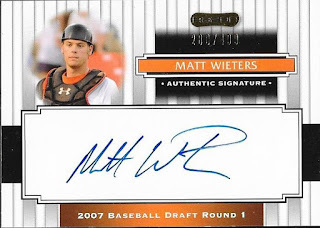 Well, I really thought he was going to sign with the Braves this offseason, but since they re-signed AJ Pierzynski, they didn't have much of a need for Matt Wieters. The market for him was shrinking, so he decided to accept the Orioles' qualifying offer. Not a bad decision, Wieters will be making 15.8 million dollars next year. 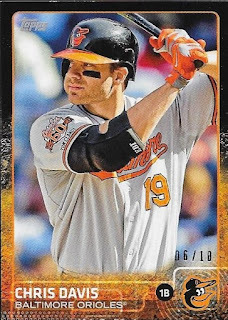 Having him back is a good thing for the Orioles, especially since Dan Duquette said today that Wieters accepting the offer won't affect their attempts to re-sign Chris Davis. 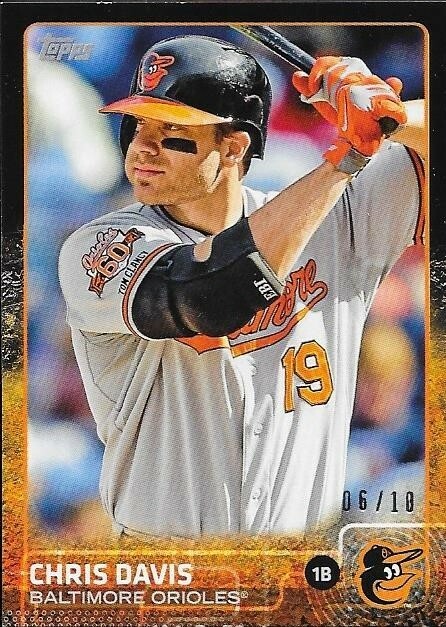 According to Roch Kubatko, Wieters said that he now plans to call the other remaining Oriole free agents and do what he can to convince them to stay (come on, Chris Davis and Darren O'Day!!). I'm glad that Wieters will be back and I am also glad that Duquette has said that the Orioles intend to continue to talk extension with him. I completed a trade last week with a guy on Instagram who goes by the screen name of Pinstripe_Pride. I sent him the Nolan Ryan coin card that I pulled from 2015 Topps Update and he sent me this Jonathan Schoop relic/auto. It is numbered 159/299 and is from 2014 Panini Classics. He didn't stop there. He sent a Willie Mays insert for Chris, an Eddie Murray from 2015 Topps Tribute and also this signed business card from MLB commissioner Rob Manfred. It was really awesome that he sent this extra stuff. I really appreciated it, and it was totally unexpected. Thanks for the deal, pinstripe_pride! Today, the 2016 BBWAA Hall of Fame ballot was announced, and to no one's surprise, it is headlined by an all-time great, Ken Griffey, Jr. The election results will be announced on January 6th, and it is a foregone conclusion that "Junior" will be elected. He wasn't my favorite player growing up, but he was near the top. Even when my friends in school were getting Jordans, I had Griffey Nikes. Man, I wish I could find a pair of those now. They were some cool shoes. Griffey was amazing to watch when he played. He is one of those players that I will tell my son about, pretty much in the same way folks told their kids about Willie Mays or Hank Aaron. 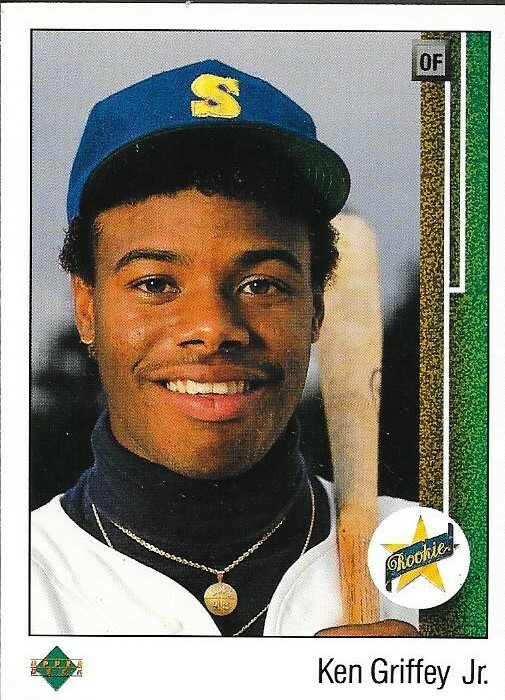 I truly believe that Griffey was one of those players who transcended generations. I think I'll have a hard time finding someone who disagrees with me. Furthermore, I think Griffey may be the reason I am waiting for Mike Trout to do something amazing. Don't get me wrong, Trout is a really good baseball player, but I think I was spoiled by watching Griffey for so long, I'm waiting on Trout to hit 80 homers and have 200 RBIs or something. Of course, some idiot will turn in a blank ballot, and other idiots will hold Griffey off of theirs because "no one has ever been a unanimous choice, so no one should ever be..." Those people need their voting privileges taken away. Seriously. Griffey isn't the only big newcomer to this year's ballot. Former ace closer, Trevor Hoffman is also eligible for the first time. Recently, the voters have become more accepting of the closer role, so maybe that will help Hoffman get in. I'm not 100% convinced that he will get in on his first ballot, though. We will see. I do anticipate Mike Piazza finally getting in. Maybe Tim Raines will see a boost in his voting as well. I think this year will see two guys make it, and if stars align, maybe a third. I doubt it will be more than two being voted in though. For more information on the Hall of Fame ballot, check their website HERE. It is that time of year, again. The two-month stretch where the Baseball Hall of Fame elections for the various "Veterans" committees and then the BBWAA ballot. I use the term "Veterans" committees with quotes because that isn't what they are referred to anymore. They are now a cyclical group that alternates between years and recently, the Hall has announced the selection of ten players, managers, umpires and executives who helped shape the game before 1946 that will be up for consideration this year. Walters - (b 1909 - d. 1991) played in the majors from 1934 to 1948 and 1950. Compiled a record of 198-160 with a 3.30 ERA. He was the 1939 NL MVP and won the World Series with the Reds in 1940. Stovey - (b. 1956 - d. 1937) played from 1880 to 1893 when the game was very different than it was today. He had 1,771 hits, 122 home runs and a .289 batting average. He led the league in home runs five times. His Hall of Fame scores on baseball-reference are really high for someone who only played 14 seasons. Check here and take a look. McCormick - (b. 1911 - d. 1982) played from 1934, 1937 to 1948. Had 1,711 hits, 128 home runs and a .299 batting average. He led the league in hits his first three full seasons. He was the 1940 NL MVP and a member of the 1940 World Series Champion Reds. Adams - (b. 1814 - d. 1899) was a member of the famed New York Knickerbocker Base Ball Club in the very early days of the game. He is credited as the creator of the shortstop position, positioning himself so he could take short throws from outfielders. He was the Knickerbocker president six times. He also manufactured baseballs and oversaw bat production. He was also a member of early league boards that saw a great number of rules and regulations be put into place. Dahlen - (b. 1870 - d. 1950) played from 1891 to 1911. Had 2,461 hits, 84 home runs and a .272 batting average. He was a member of the 1905 World Series Champion New York Giants. Ferrell - (b. 1908 - d. 1976) North Carolina's own, Wes Ferrell, played from 1927 to 1941 with a 193-128 record. He pitched to a 4.04 career ERA. Brother of Hall of Famer, Rick Ferrell, it has been said that he was the more deserving of the Ferrell brothers to be enshrined in Cooperstown. If he were to get in, his 4.04 ERA would be the highest among pitchers in the HOF. Marion - (b. 1917 - d. 2011) played from 1940-1950, 1952 and 1953. Had 1,448 hits, 36 home runs and a .263 batting average. He was the 1944 NL MVP and won the World Series with the Cardinals in 1942, 1944 and 1946. He was also regarded as one of the best fielding shortstops of his era. Breadon - (b. 1876 - d. 1949) A former MLB executive who was the majority owner of the St. Louis Cardinals from 1920 to 1947, during which time they won six World Series (1926, 1931, 1934, 1942, 1944 and 1946) and appeared in three others (1928, 1930 and 1943). Herrmann - (b. 1859 - d. 1931) Former president of the Cincinnati Reds from 1902 to 1927 and former president of the National Commission from 1903 to 1920. His Reds won the World Series in 1919. Von Der Ahe - (b. 1851 - d. 1913) Purchased the bankrupt St. Louis Brown Stockings in 1882 for $1,800 and joined the American Association. Very much a showman, pre-dating te likes of Bill Veeck and Charles Finley, he is sometimes credited as the first to sell hot dogs at games (although this has been disputed) and is also credited with coining the term fanatics/fans. 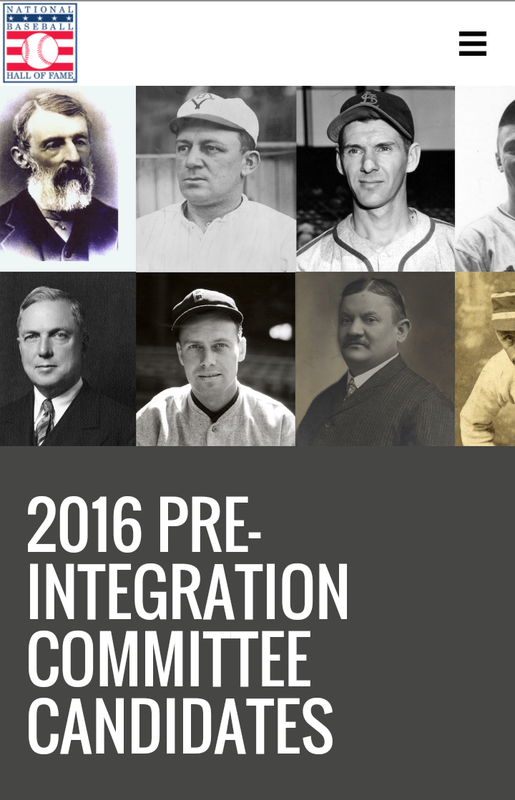 The last time the Pre-Integration Committee was up for election, they chose Hank O'Day, Deacon White and Jacob Ruppert to enter the Hall. It is difficult to predict which, if any, of these guys will get in. If I had to guess, I would say that Stovey and Breadon had the best chances to get in. Adams could get in, as well. Walters has the better stats of the rest of the players, but I doubt he, or any of the others would have a shot at getting in. That being said, I do have some hope that Marion would make it. 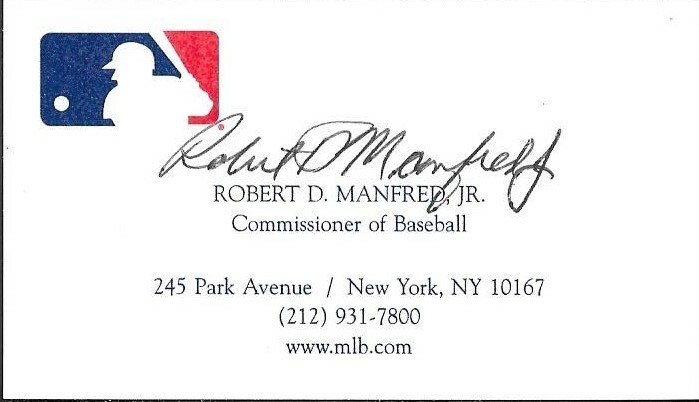 He passed away not too long ago, and was a really good TTM signer. For my own selfish reasons (that would add a ball to my HOF collection), it would be cool for him to get in. There are players with worse numbers than him in the Hall. To be elected, a player must receive votes on at least 75% of the ballots cast from the 16-member electorate who will be determined later by the Hall of Fame. The results will be announced during the Baseball Winter Meetings in Nashville, TN between December 6 and 7, 2015. 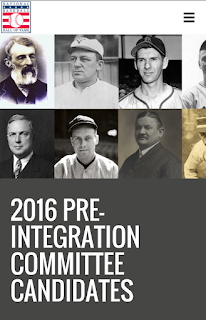 To read more about the candidates and rules for selection, check out the Baseballhall,org webpage. In August, I lost my cat, Jericho and was very devastated because of it. Today, I learned that my younger brother, Andy's, dog, bruiser has a ruptured disc in his spine. He got the injury a couple days ago when he fell after jumping off of Andy's bed. He is doing ok, but will require surgery to correct the problem. Otherwise, he will have a long rehab that will likely change his quality of life, forever. Poor little guy can barely move, and now has to be carefully transported so that he can go outside to do his business. He will have to stay in his crate for at least a month (unless Andy can afford to get the surgery done). I feel really bad for my brother. When Jericho passed, it was really quick, so I didn't have to see my friend in any real pain (save from that last bath), but with Bruiser, at least he has a good chance of being ok. I just hate that the surgery will cost a young college-aged kid thousands of dollars. I called him when I found out, and gave him some ideas, such as starting a GoFundMe page, or asking for a couple estimates from veternarians and seeing about financing plans. Andy and his girlfriend took my advice and started a GoFundMe page for Bruiser's surgery, so I'm hoping that helps. He's a cool little guy, who has been over to visit a couple times now. I hope he will be well enough to come and visit again, soon! I'm not asking anyone for donations, but if you ARE interested, here is a link to Andy and Camryn's (his lady-friend) GoFundMe page. Good luck, Bruiser! On Halloween, my wife and I took our son to the local comic shop since they were having some Halloween festivities. We didn't have time to get into our costumes, but they were having a costume party, a bouncy house, free comic giveaways and a comic book artist was there to draw stuff for people. He was also giving away free sketch cards to people, and also had some for sale. I picked up a couple that I thought were really cool. The above Alien (Xenomorph) card was pretty cool. Since Aliens is my all-time favorite movie, I had to pick this up. I got this one for free. As you can see, the flaming skull really stands out. When I was very little, we would play a card game in my grandparents' basement on Sunday afternoons. It was an old Marvel game, kind of like Old Maid, but featured Dr. Doom. My brothers and I would beg our grandfather to play the game, and would have a lot of fun. If it was the winter time, Grandpa would build a fire in the fireplace in that basement, and we would all stay down there until Grandma called us up for dinner, or until we would have to go to Youth Group. We played that Marvel game a lot, until Grandpa taught us how to play Michigan Poker. Anyway, Ghost Rider always stood out to me, so when I became old enough to read and enjoy comics, he was the hero I went after. It's funny, he was my favorite hero, and Dr. Doom was my favorite villain. I'm certain that ties back to the card game as well. 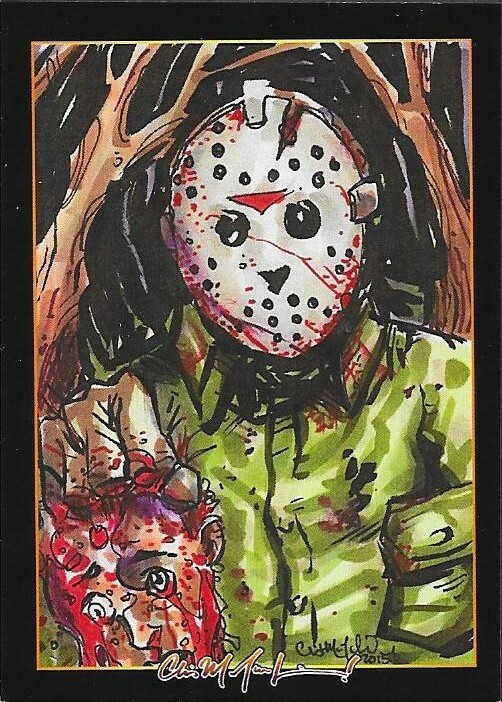 Finally, Chris picked this Jason sketch as his freebie. 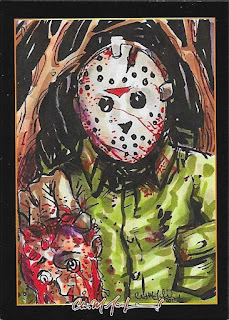 Chris loves the Friday the 13th movies, so when he saw this Jason sketch, he had to get it. I'm holding onto it for him, since he tends to lose things. I rather enjoy the Friday the 13th films as well, so this would have been something I would have probably picked up for myself as well. The artist gave me a business card, but I misplaced it. I believe his name is Chris McJunkin. I'm sure a google search will bring up his information. He signed the backs of each sketch card for us, and I also bought a larger print, but that will be put to use later. I really enjoyed the trip to the comic shop. I hope they continue to have these promotions. It seems like Chris really enjoyed it. He still has a hard time getting interested in reading, but I'm hoping the comics will help. I busted a jumbo box of 2015 Topps Update when it first came out. The contents of the box weren't really much to be excited about, but the set is pretty nice. I don't believe I will be putting the set together. Also, the Orioles in the series are only OK. I mean, there are All Star cards, and all, but the only Oriole I was really excited to see in the set was Tyler Wilson. I did pull his base card, so that was nice. The Darren O'Day card was a good one, too. I might pick up some of the different versions of it. 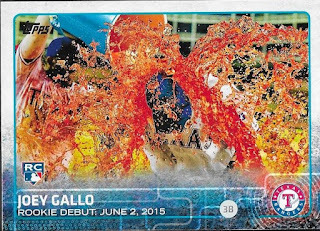 As always, there are some really good photographic shots in this set, as seen in the Joey Gallo rookie debut card above. 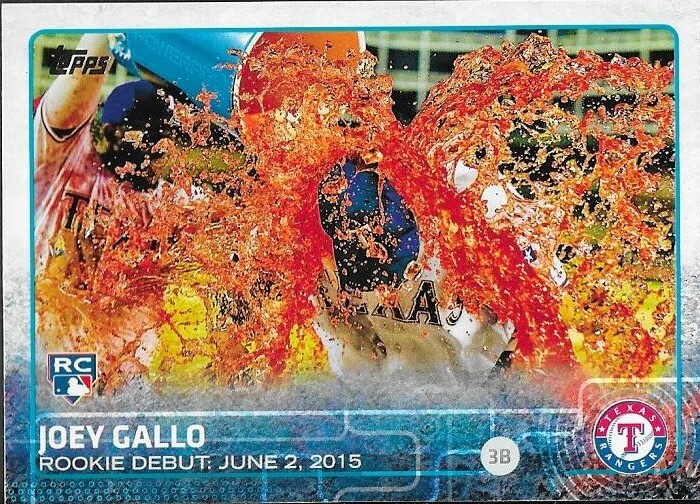 I think these Gatorade shower cards are really cool. I was pretty happy with my Update box. I got the Nolan Ryan manufactured coin card, which is in a pending trade. I got an auto of Jason Rogers (never heard of him), but it is sold to my friend, Bryce. I also got a Paul Goldschmidt All Star relic card that I plan on hanging onto for the time being. I did get a SP card, the sabermetric stats Gerrit Cole. Not bad. I got a package today from my very good friend, Andrew, that had my birthday gift that he had been meaning to send me for a while. He has been really busy with school and cross country, so he hasn't had much time to get to the post office. That's ok, though, because that makes it so I can stretch my birthday out as long as possible!! Andrew really hit it out of the park with his gift. 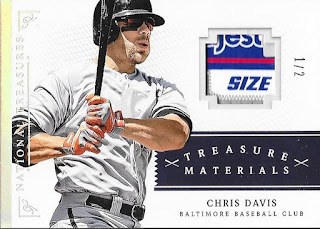 He picked up this 2014 Panini National Treasures booklet of Chris Davis with an amazing patch. The booklet is numbered 2/15. I had some booklet toploaders, but I used them all on the ones I got from Blaine, so I need to grab a few more. I have all of my booklets on display in my display case, using the booklet toploaders and card stands. They all look really cool staggered together on the glass shelves. I'm really happy with the setup. Otherwise, I'm not too sure how they would be stored. I feel like they have to be displayed. I really appreciate the awesome gift, Andrew. This patch is so amazing. Thanks so much! I got a birthday package a few weeks ago from my friend, Ben. The highlight of the package was this 2003 UD Sweet Spot Classic relic card of Cal Ripken. I actually didn't have this card in my collection, so it was a real hit for me. There were a bunch of other Orioles cards in the package, as well, but adding a Ripken that I didn't already have is a huge bonus. I really appreciated the thought from Ben, especially since he has been so busy lately with school, work, and baseball. The fact that he took time out to think of me really meant a lot. Thanks for the gift, Ben!